Good Monday morning everyone, hope that everyone had a great weekend. I know that its getting closer to Christmas and the holidays. So I wanted to display a new ladies vest for all of you today. This one is a beauty, and would be a nice gift for that special someone in your life. 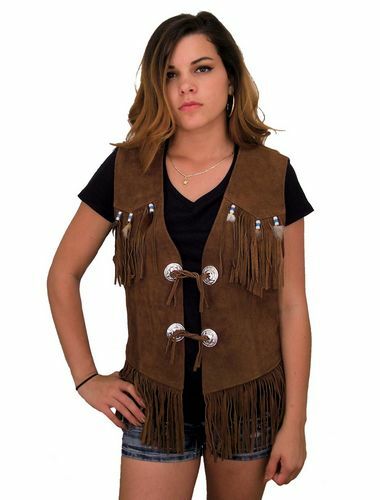 This ladies western style brown suede leather vest has a lot of features. It is a very popular item from our ladies department. It is made from genuine suede leather and is very stylish. It has large size Conchos and leather laces to give it that Western elegance. This beautiful ladies Western Style Brown suede and leather vest is also very movable and breathable with a soft textile lining that helps with weather as well as the elegant style. It also has two inside slip pockets that gives you a place for your personal items in a discreet way. Aside from these features it also has lots of detail on the back with all the beading with the feathers and the fringe. You can also see it has some on the front as well with the fringes at the bottom edge that gives off more of that western style. So if you are looking for an unique leather suede vest for that woman in your life for the holidays then this might be for her! We have so much more stuff as well if it isn’t really what your looking for. Holidays again can be really stressful so we can help you look for other biker related items throughout the site. We are still holding a sale that last up until December 24th. You will find that everything on the site is 10% off store wide! Just use coupon code XMAS10 at checkout when you purchase your items. 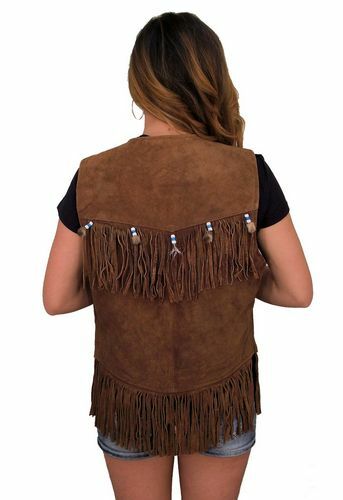 So again if you are interested in this ladies western style leather vest please check it out you will be glad you did!! Click here to check out this ladies suede leather vest now! !